The vessel was constructed for Carnival Cruise Lines and entered operation in 1986 as Jubilee. Jubilee was one of three Holiday class ships constructed for Carnival, along with near-sister ships Holiday and Celebration. 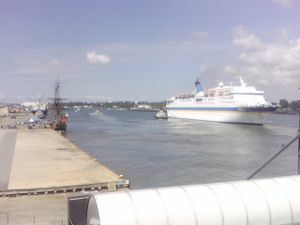 In 2004, the vessel was transferred to P&O Cruises Australia, and was renamed Pacific Sun. Pacific Sun arrived in Australia in November 2004, and began year-round cruises from Sydney to the South Pacific and tropical north Queensland. Pacific Sun's relocation to Brisbane has seen her become the largest year-round liner ever to be based in Queensland. ↑ 1.0 1.1 1.2 1.3 1.4 1.5 1.6 Asklander, Micke. "M/S Jubilee (1986)" (in Swedish). Fakta om Fartyg. http://www.faktaomfartyg.se/jubilee_1986.htm. Retrieved 2008-10-17. ↑ 2.00 2.01 2.02 2.03 2.04 2.05 2.06 2.07 2.08 2.09 2.10 2.11 2.12 Ward, Douglas (2008). Complete Guide to Cruising & Cruise Ships. London: Berlitz. pp. 515–516. ISBN 978-981-268-564-3. This page was last edited on 14 September 2010, at 12:08.